Walter grew up in South Africa with his German heritage mother baking bread every day. He moved to Australia and struggled to find good wholesome bread like he was used to. Over the years he made bread and in time he tried to replicate a bread that an Aunt made back in South Africa, a Sourdough Bread. So he studied up and made sourdough breads for many years, trying different methods and starters and he eventually ended up with a delicious white sourdough that he shared with his friends and family. A home renovation gave him the space to make more bread and he slowly offered bread for sale. Little did he know how many other people were looking for good bread! Eventually his ‘hobby’ became to big for him alone, and the team expanded. We now have a wonderful, committed team making the best sourdough bread, and delivering to you all around the Sunshine Coast and Brisbane from our new premises at the Big Pineapple. So now your family can also enjoy the fruits of Walter’s search for good bread for his family and reap the benefits of eating long fermented sourdough bread just like our family has done for years. We have a passionate team of foodies who help to make and deliver our bread all around the coast. 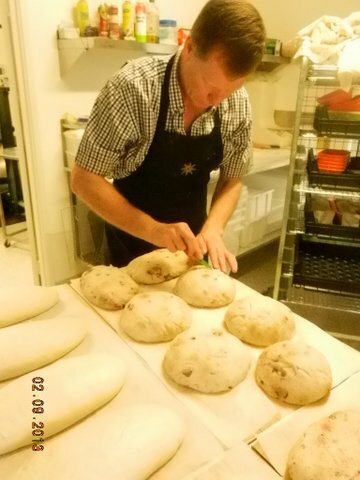 Our Head Baker/Manager Andrew Frost comes from a baking family, as do many in the team. All are committed to bringing you the freshest and healthiest bread available using the finest ingredients they can source. They take pride in being part of an Artisan team of bakers who make bread the old fashioned way, something unusual in today’s fast paced world. Our Head Baker Andrew, surrounded by his passionate baking team, Helga, Cameron and Dale. Vivien helps to keep the ship running smoothly and will probably be the one who answers the phone if you call as well as managing the accounts and general administration. We like to keep her busy! Tim and David spend their days packing and delivering our fine bread to the stores, please say hello if you see them on their rounds.